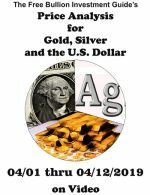 A law titled; 'America the Beautiful National Parks Quarter Dollar Coin Act of 2008,' authorized the production of a 5 oz., investment-grade silver bullion coin. 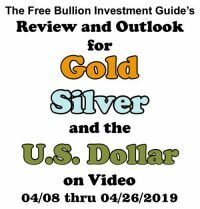 The Silver Bullion Coins are legal tender which means the coin's weight, content, and purity are fully backed by the United State's government. 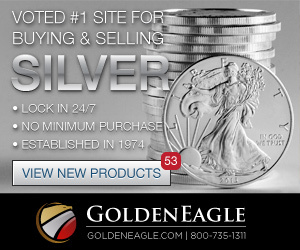 The bullion coins are replicated from designs featured on the US Mint's 'America the Beautiful' Circulated Quarters. The reverse of the America the Beautiful 5 oz. 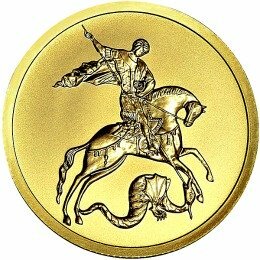 Bullion Coin will feature a national park or site found in each of the 50 states and six territories. 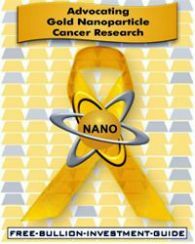 The territories include the District of Columbia, Puerto Rico, Guam, American Samoa, U.S. Virgin Islands and Northern Mariana Islands. 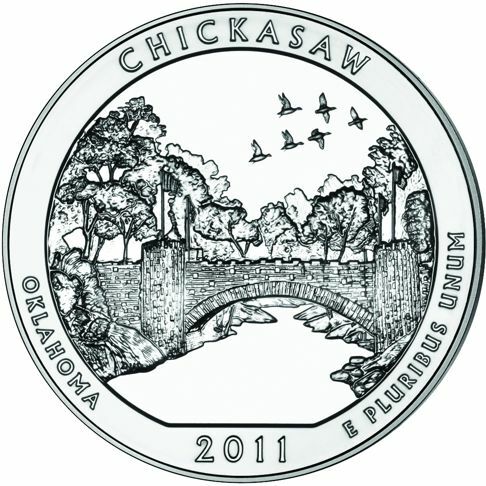 The quarters are issued in the order in which the honored site was first established as a national site, the production of the American the Beautiful Quarters will go on until 2021. 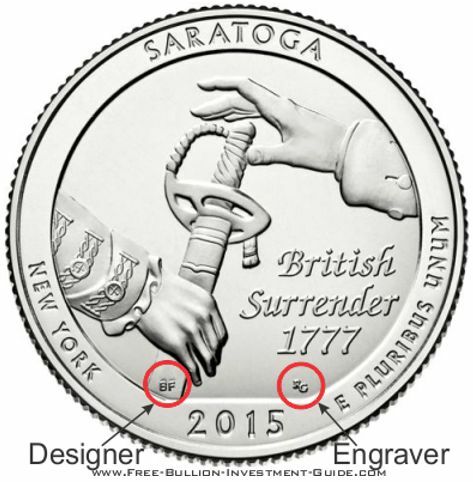 The 1932 portrait of George Washington by John Flanagan is on the obverse side of every 5oz. silver bullion coin in the America the Beautiful series. It is the same portrait found on every US quarter, in circulation. The design has been restored by William Cousins to bring out the detail of Flanagan's original design. 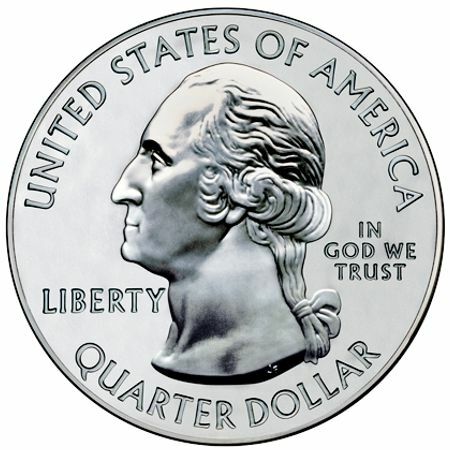 Inscribed across the top of the silver bullion coin are the words "UNITED STATES OF AMERICA" and displayed across the bottom is coin's official legal tender value of a "QUARTER DOLLAR." 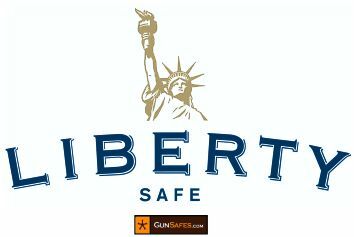 On one side of George Washington is the word "LIBERTY" and "IN GOD WE TRUST" is on the other. The reverse side of every America the Beautiful 5 oz bullion coin displays a design of a National Park, District or US Territory, designated for that coin. 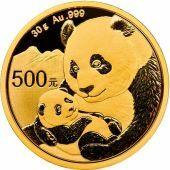 Across the top of the bullion coin will display of the National Park. 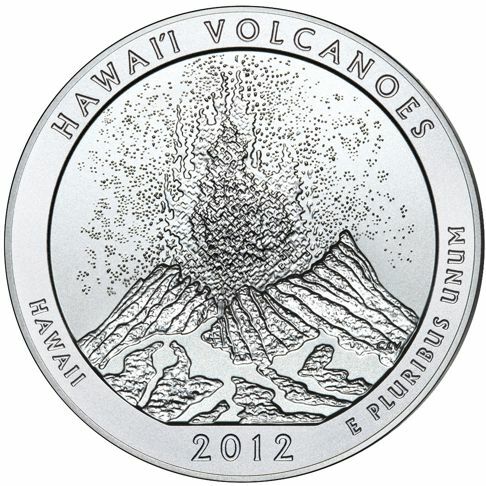 Along the bottom of the silver coin is the name of the state where the national park is located, the coin's 'Year of Issue' and "E PLURIBUS UNUM." 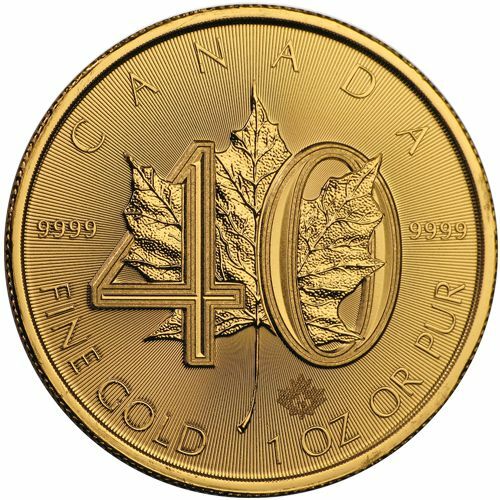 The Edge of the 5 oz. 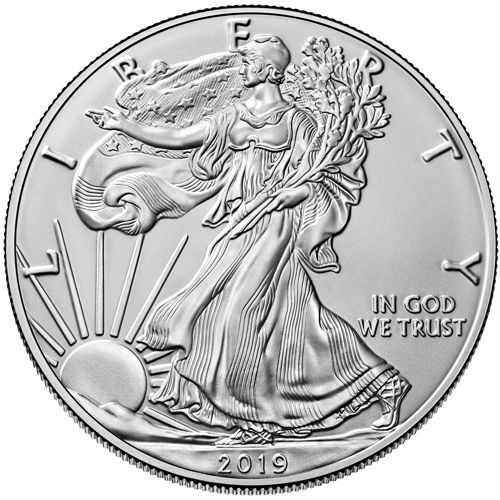 America the Beautiful Silver bullion coin has Incused - Lettering. The lettering states the bullion coins' Fineness ".999 FINE SILVER" and Weight "5.0 OUNCE." 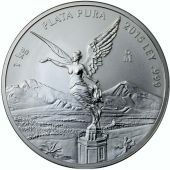 Silver America the Beautiful 5oz. Reverse: Displays the façade of the Hot Springs National Park headquarters building. 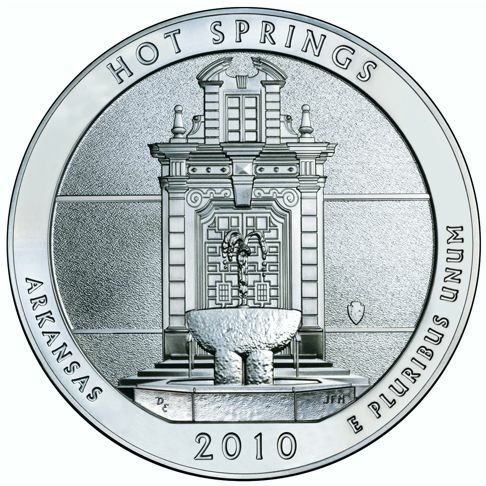 Inscriptions: HOT SPRINGS, ARKANSAS, 2010 and E PLURIBUS UNUM. Reverse: Shows the Old Faithful geyser with a bull bison in the foreground. 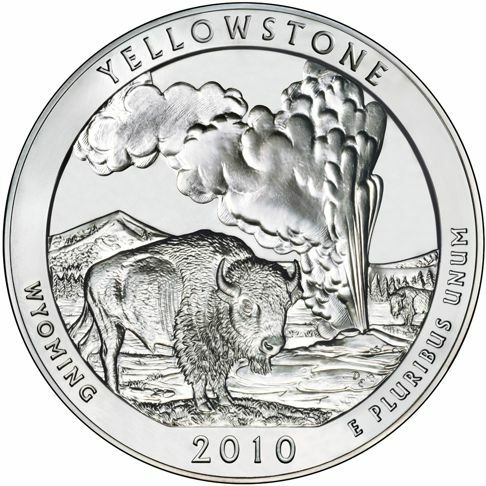 Inscriptions: YELLOWSTONE, WYOMING, 2010 and E PLURIBUS UNUM. Reverse: Displays the iconic El Capitan, the largest monolith of granite in the world, it rises more than 3,000 feet above the valley floor. 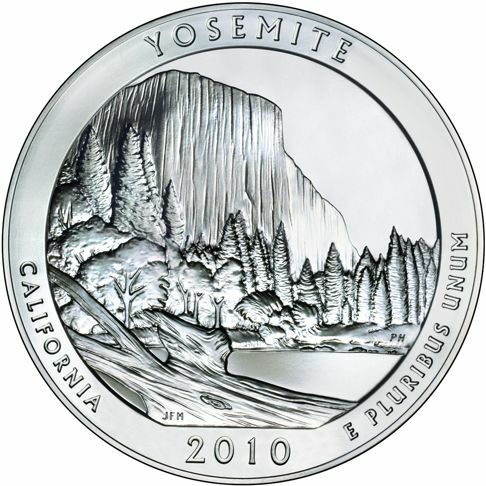 Inscriptions: YOSEMITE, CALIFORNIA, 2010 and E PLURIBUS UNUM. Reverse: Depicts a view of the granaries above the Nankoweap Delta in Marble Canyon. 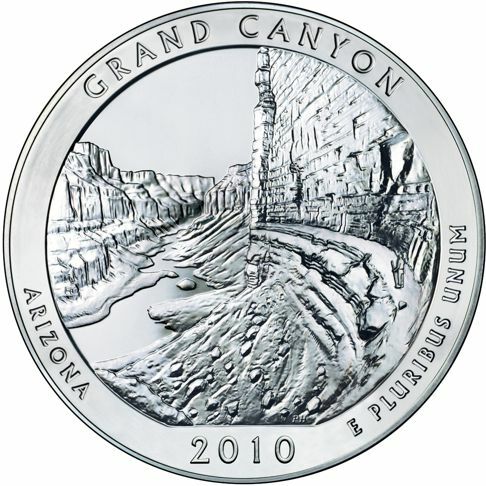 Inscriptions: GRAND CANYON, ARIZONA, 2010 and E PLURIBUS UNUM. Reverse: Features the view of Mount Hood with Lost Lake in the foreground. 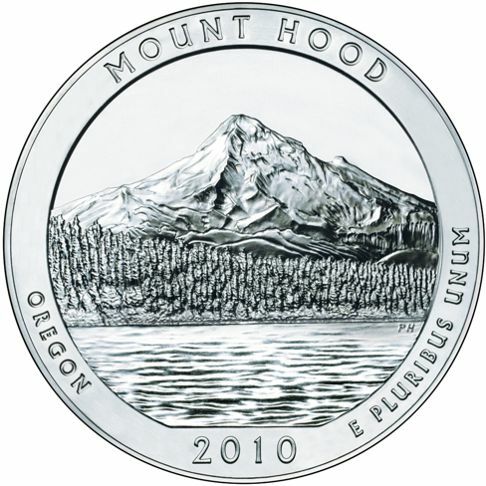 Inscriptions: MOUNT HOOD, OREGON, 2010 and E PLURIBUS UNUM. Reverse: Displays the 72nd Pennsylvania Infantry Monument, it is found on the battle line of the Union Army at Cemetery Ridge. 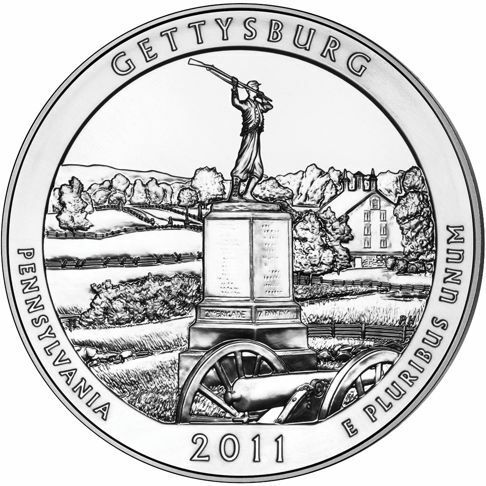 Inscriptions: GETTYSBURG, PENNSYLVANIA, 2011 and E PLURIBUS UNUM. 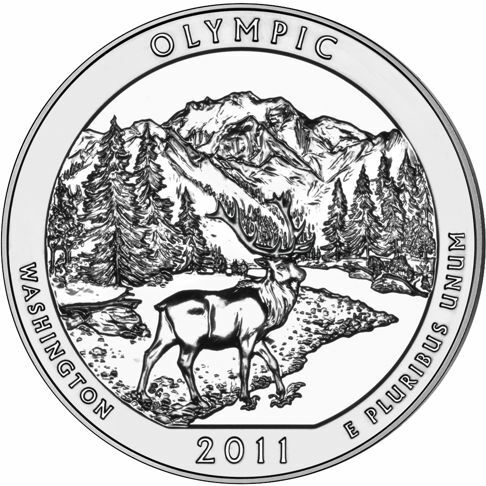 Reverse: Displays a view of the slopes of Mount Reynolds in the distance, with a mountain goat climbing over rocky slopes. 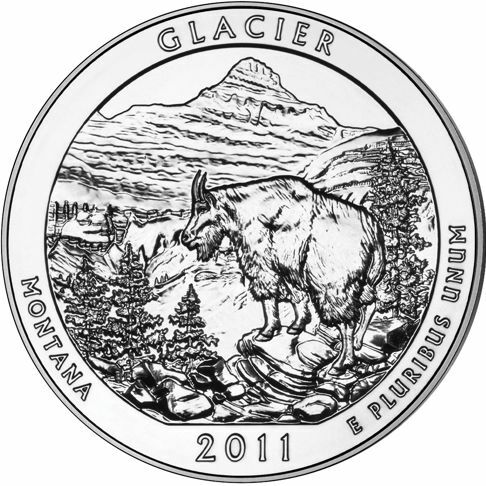 Inscriptions: GLACIER, MONTANA, 2011 and E PLURIBUS UNUM. Reverse: Features the U.S.S. Cairo on the Yazoo River as it would have been seen when it served the Union Navy during the Civil War. 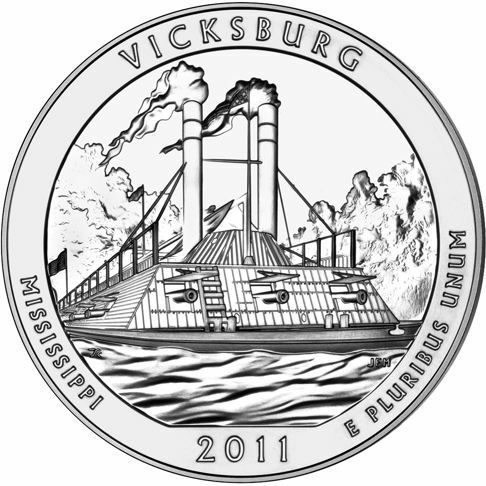 Inscriptions: VICKSBURG, MISSISSIPPI, 2011 and E PLURIBUS UNUM. Reverse: Shows a Roosevelt elk standing on a gravel river bar of the Hoh River with the view of Mount Olympus in the background. 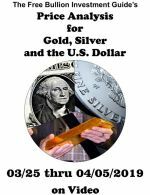 Inscriptions: OLYMPIC, WASHINGTON, 2011 and E PLURIBUS UNUM. 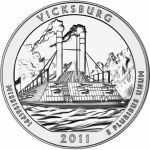 Reverse: Depicts the Lincoln Bridge, built of limestone and dedicated in 1909 to celebrate the centennial of Abraham Lincoln's birth. 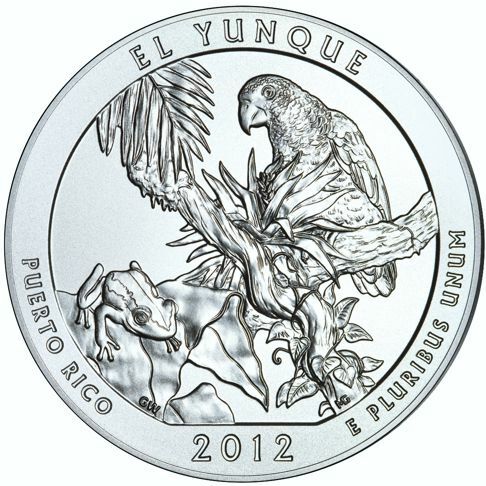 Reverse: Depicts a Coqui tree frog on a leaf and a Puerto Rican parrot behind an epiphyte plant. Reverse: Is a view of two elevated kivas that are part of the Chetro Ketl Complex, the north wall of Chetro Ketl and the canyon. 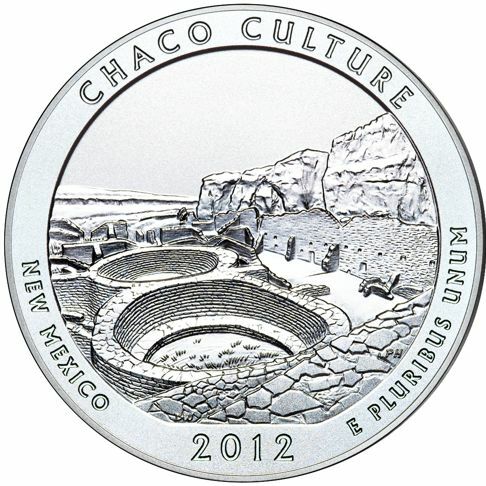 Inscriptions: CHACO CULTURE, NEW MEXICO, 2012 and E PLURIBUS UNUM. Reverse: The Bass Harbor Head Lighthouse and Acadia's rough coastline. 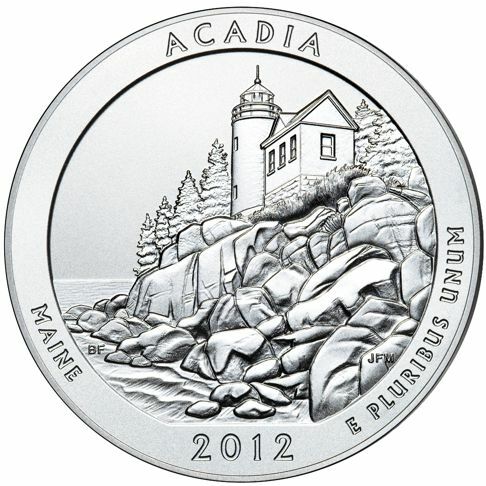 Inscriptions: ACADIA, MAINE, 2012 and E PLURIBUS UNUM. 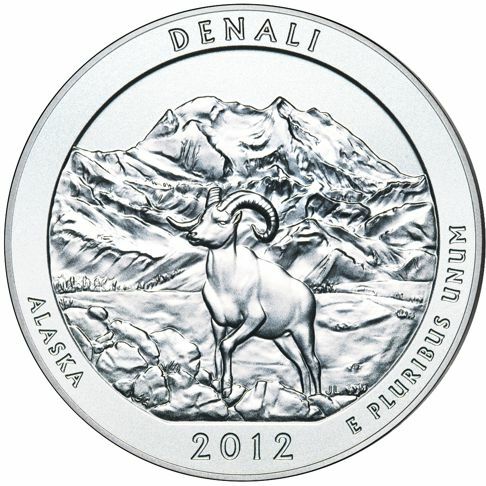 Reverse: Displays a Dall sheep with Mount Mckinley (a.k.a - Mt. Denali) rising in the background. Inscriptions: DENALI, ALASKA, 2012 and E PLURIBUS UNUM. Reverse: Framed by birch trees, displayes Mt. Chocorua, the easternmost peak of the Sandwich Range. 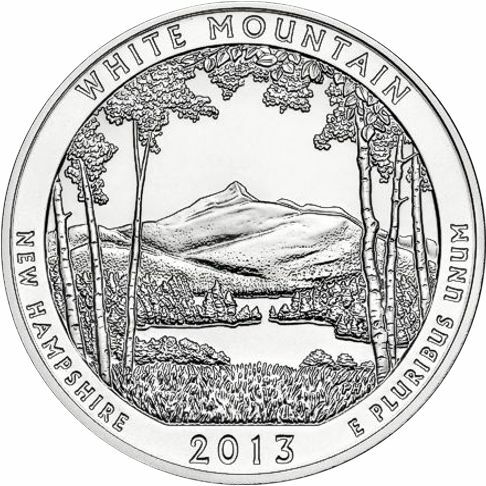 Inscriptions: WHITE MOUNTAIN, NEW HAMPSHIRE, 2013 and E PLURIBUS UNUM. 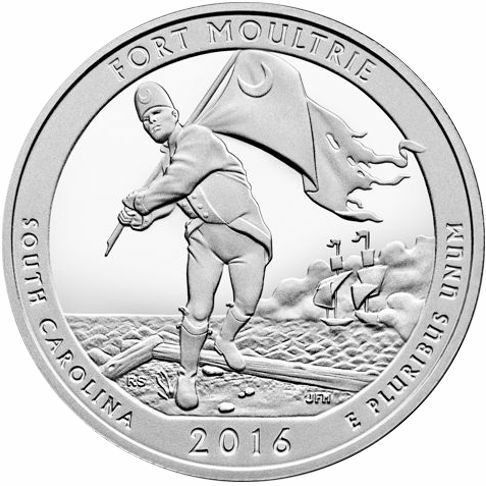 Reverse: Depicts the statue of Master Commandant Oliver Hazard Perry with the Peace Memorial in the background. 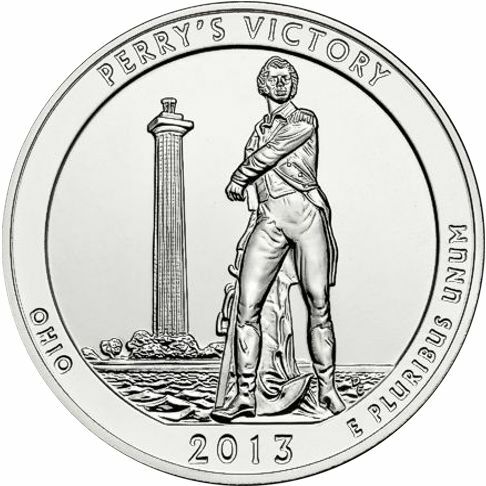 Inscriptions: PERRY'S VICTORY, OHIO, 2013 and E PLURIBUS UNUM. 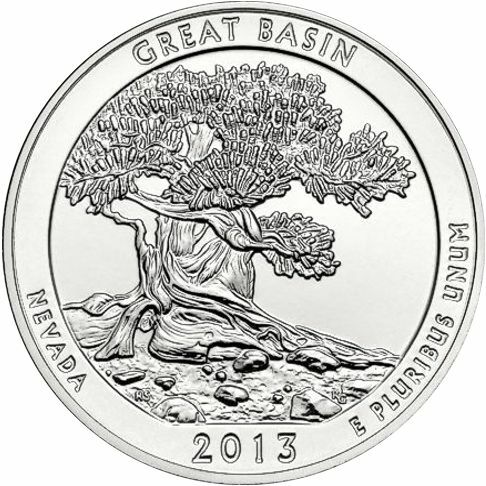 Reverse: Depicts the unique qualities of the single Bristlecone Pine tree and the rocky glacial terrain, where the trees grow. 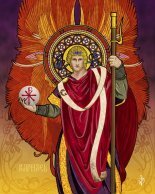 Inscriptions: GREAT BASIN, NEVADA, 2013 and E PLURIBUS UNUM. 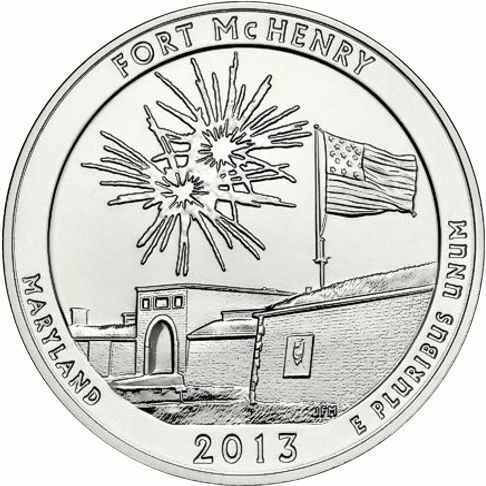 Reverse: Depicts the site during the "Defenders Day" celebration, at Fort McHenry. The fireworks symbolize the "rocket's red glare," linking the fort to its historic past, where Francis Scott Key penned the Star Spangled Banner. Inscriptions: FORT McHENRY, MARYLAND, 2013 and E PLURIBUS UNUM. Reverse: The design is inspired by photos of men who are adding the final details to Thomas Jefferson's face. 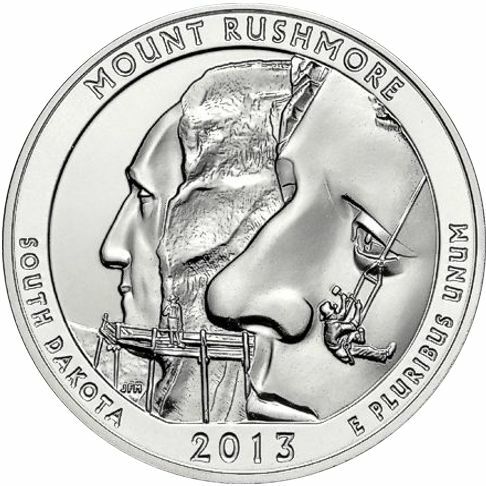 Inscriptions: MOUNT RUSHMORE, SOUTH DAKOTA, 2013 and E PLURIBUS UNUM. Reverse: displays a log cabin at the Great Smoky Mountains National Park. 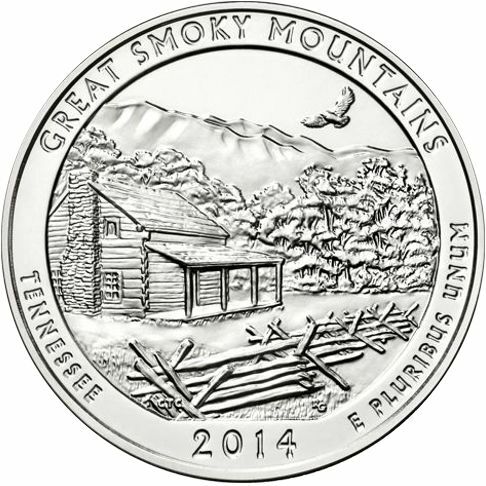 Inscriptions: GREAT SMOKY MOUNTAINS, TENNESSEE, 2014 and E PLURIBUS UNUM. Reverse: depicts a hiker taking in the view from Little Stony Man summit. 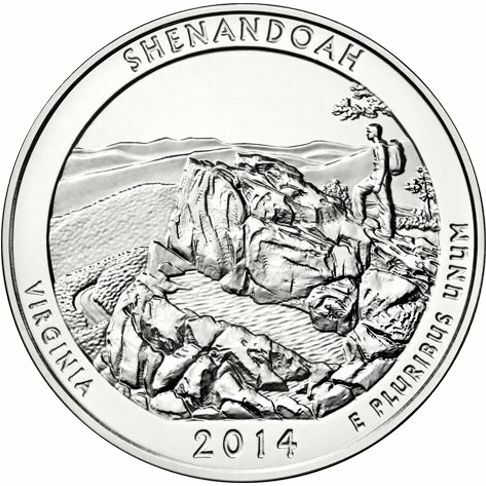 Inscriptions: SHENANDOAH, VIRGINIA, 2014 and E PLURIBUS UNUM. 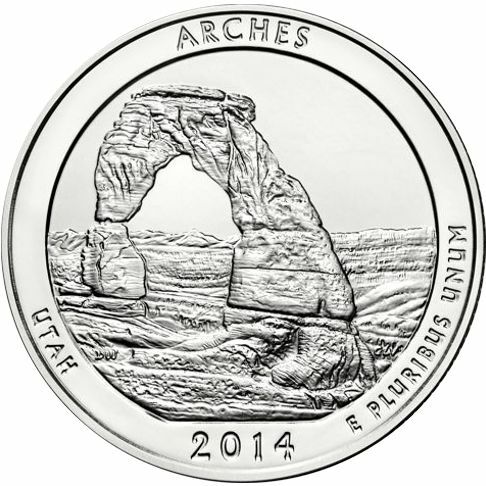 Reverse: displays Delicate Arch, a 65-foot freestanding natural arch. The La Sal Mountains are in the background..
Inscriptions: ARCHES, UTAH, 2014 and E PLURIBUS UNUM. Reverse: displays a father and son playing in the sand next to a creek bed. The mountains and dunes are featured in the background. 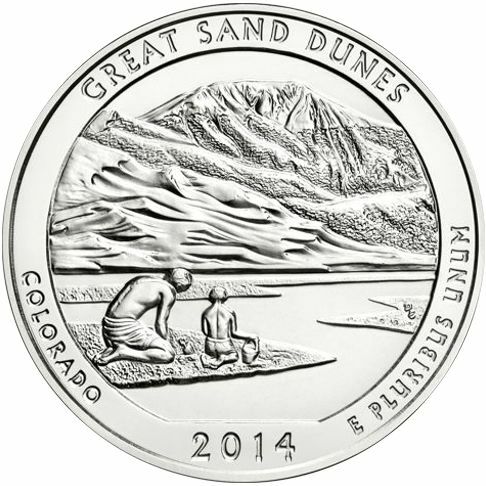 Inscriptions: GREAT SAND DUNES, COLORADO, 2014 and E PLURIBUS UNUM. Reverse: depicts an Anhinga, stretching its wings, with a Roseate Spoonbill visible in the mid-ground. 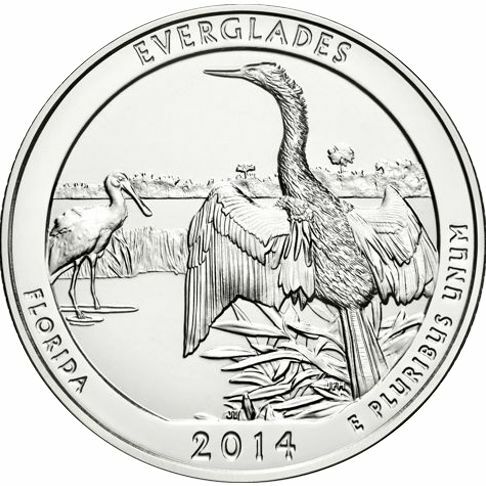 Inscriptions: EVERGLADES, FLORIDA, 2014 and E PLURIBUS UNUM. 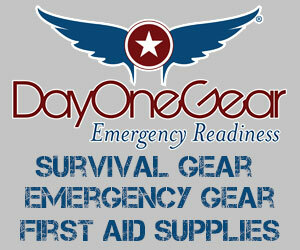 Reverse: Displays the three fundamentals of survival common to all Homesteaders: Food, Shelter, and Water. 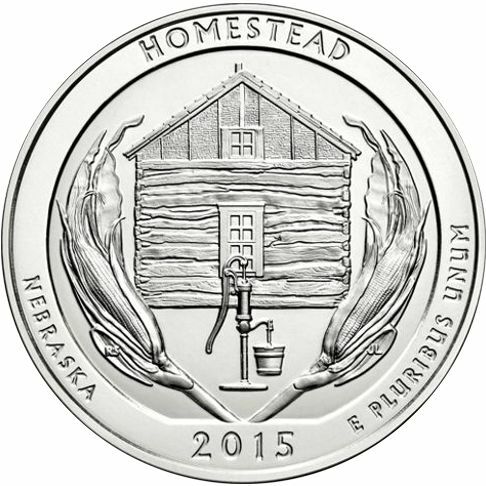 Inscriptions: HOMESTEAD, NEBRASKA, 2015, and E PLURIBUS UNUM. Reverse: Displays a wild turkey in flight over blue stem grass with a long leaf pine in the background. 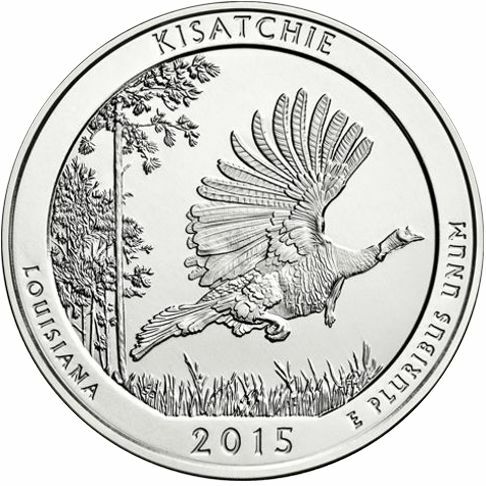 Inscriptions: KISATCHIE, LOUISIANA, 2015, and E PLURIBUS UNUM. Reverse: Displays the North Carolina state flower in the foreground and the parkway's beauty as it winds through the Blue Ridge Mountains. 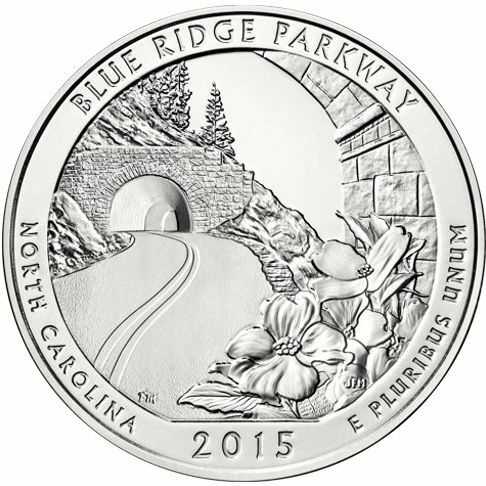 Inscriptions: BLUE RIDGE PARKWAY, NORTH CAROLINA, 2015, and E PLURIBUS UNUM. Reverse: Displays a Great Blue Heron in the foreground and a Great Egret, in the background. 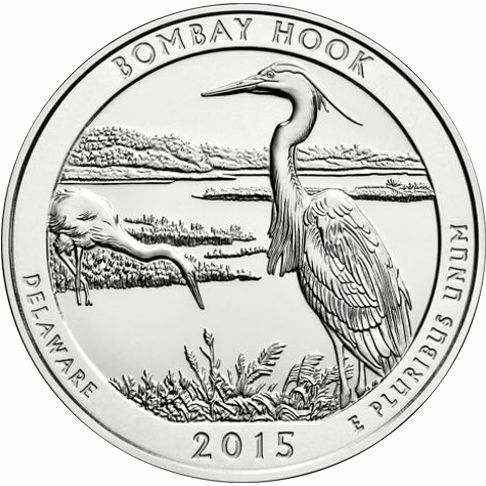 Inscriptions: BOMBAY HOOK, DELAWARE, 2015, and E PLURIBUS UNUM. 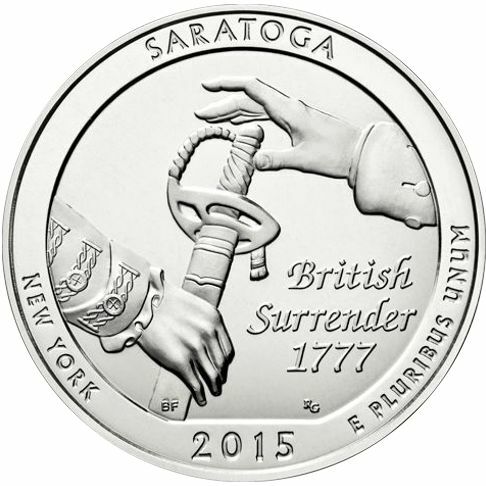 Inscriptions: BRITISH SURRENDER 1777, SARATOGA, NEW YORK, 2015, and E PLURIBUS UNUM. Reverse: displays a view of Camel Rock with natural foliage in the foreground and a red-tailed hawk soaring in the sky. 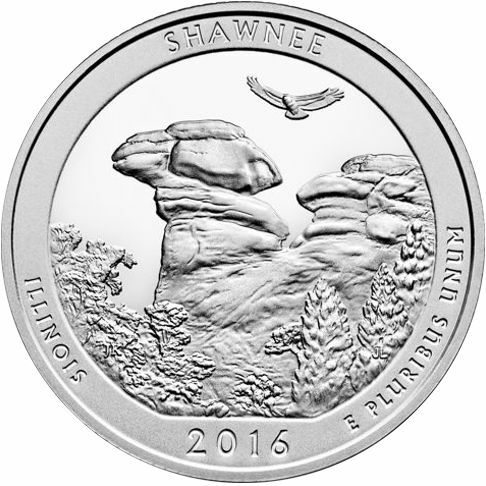 Inscriptions: SHAWNEE, ILLINOIS, 2016, and E PLURIBUS UNUM. Reverse: Depicts a settler surveying the mountains to the West. 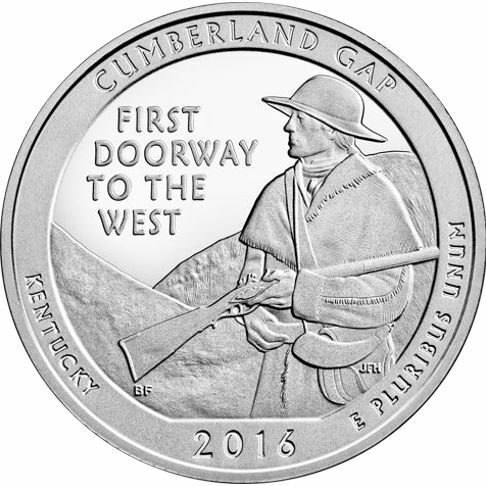 Inscriptions: CUMBERLAND GAP, KENTUCKY, 2016, E PLURIBUS UNUM and FIRST DOORWAY TO THE WEST. 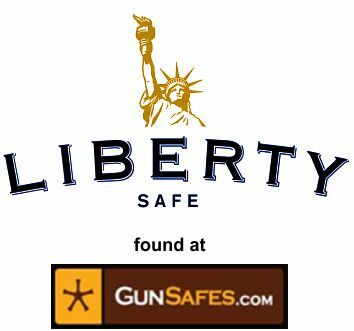 Reverse: features John Brown's Fort, the site of John Brown’s last stand during his raid on the Harper’s Ferry Armory. 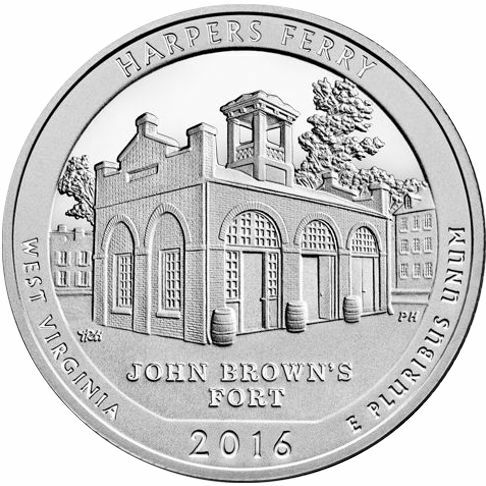 Inscriptions: HARPERS FERRY, WEST VIRGINIA, 2016, E PLURIBUS UNUM and JOHN BROWN'S FORT. Reverse: displays a young Theodore Roosevelt on horseback surveying the terrain near the Little Missouri River. 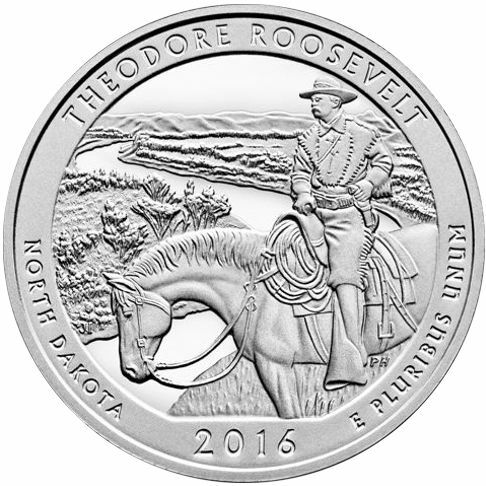 Inscriptions: THEODORE ROOSEVELT, NORTH DAKOTA, 2016, E PLURIBUS UNUM. Reverse: shows Sergeant William Jasper returning the regimental flag to the ramparts while under attack from a British ship. 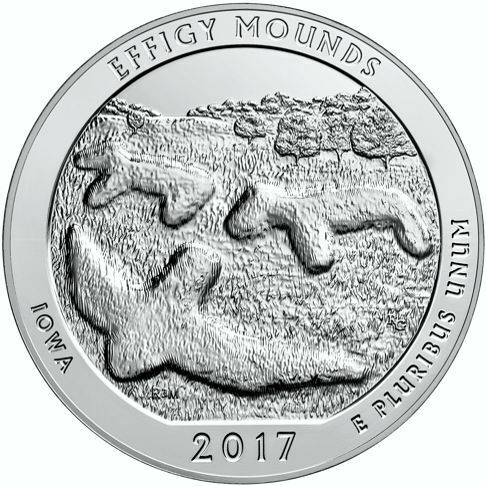 Inscriptions: EFFIGY MOUNDS, IOWA, 2017, and E PLURIBUS UNUM. 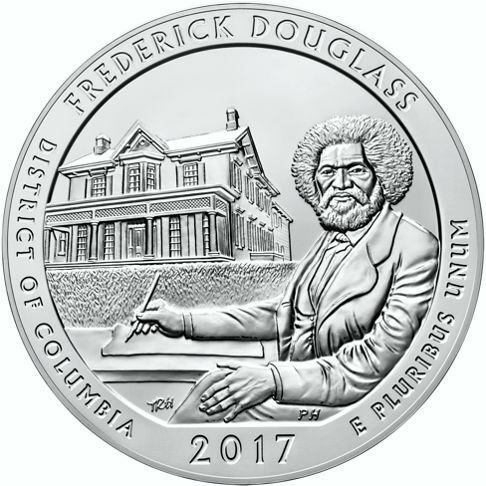 Inscriptions: FREDERICK DOUGLASS, DISTRICT OF COLUMBIA, 2017, and E PLURIBUS UNUM. Reverse: Alley Mill, a steel roller mill built in 1894, it converted wheat into flour. Most of the original milling equipment still exists, and visitors can tour the mill. 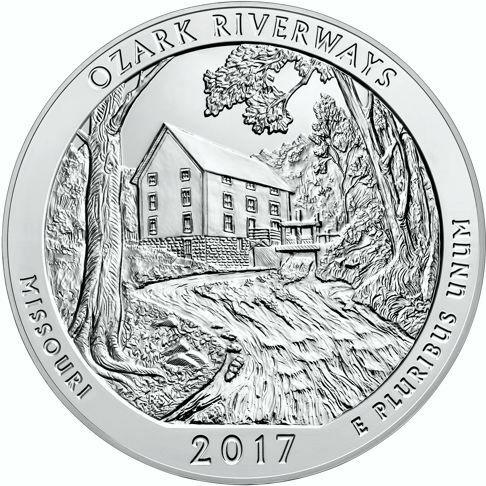 Inscriptions: OZARK RIVERWAYS, MISSOURI, 2017, and E PLURIBUS UNUM. 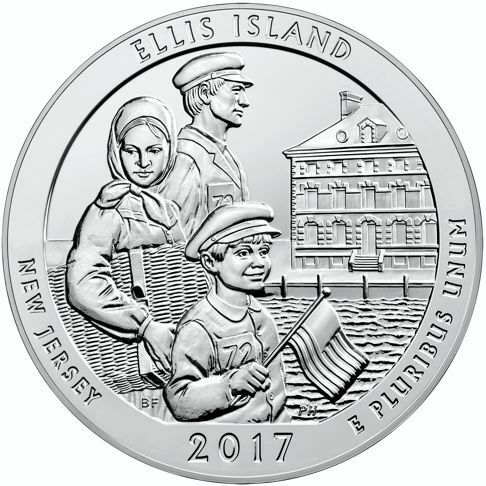 Reverse: depicts a hopeful immigrant family approaching Ellis Island. Inscriptions: ELLIS ISLAND, NEW JERSEY, 2017, and E PLURIBUS UNUM. Reverse: displays George Rogers Clark leading his men through the flooded plains approaching Fort Sackville. 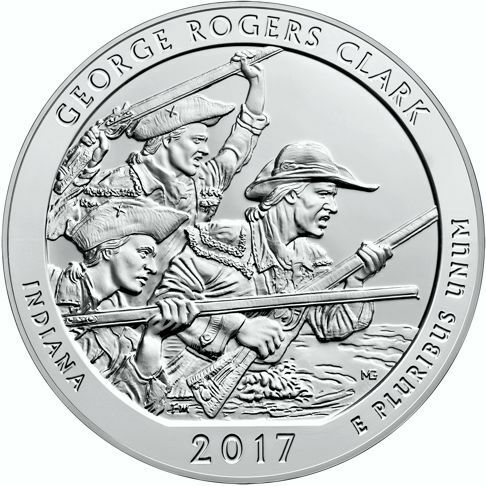 Inscriptions: GEORGE ROGERS CLARK, INDIANA, 2017, and E PLURIBUS UNUM. 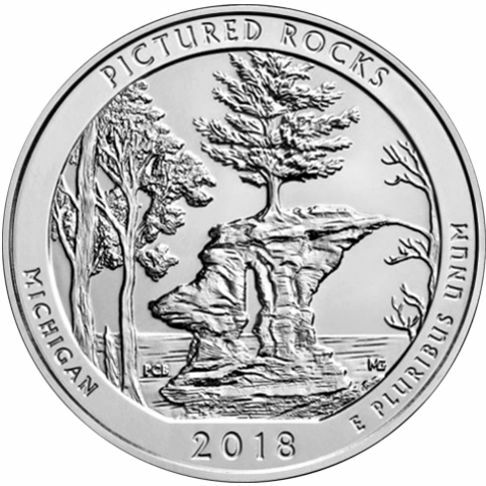 Inscriptions: PICTURED ROCKS, MICHIGAN, 2018, and E PLURIBUS UNUM. 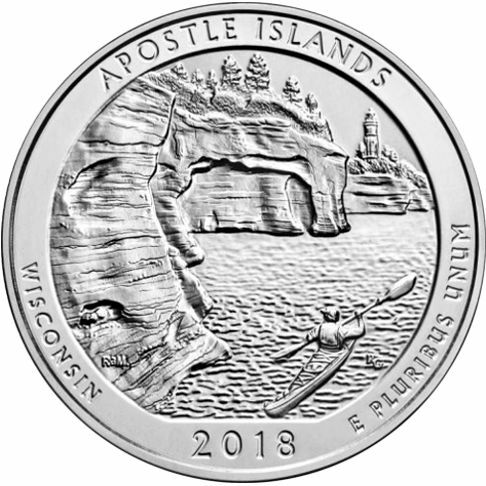 Inscriptions: APOSTLE ISLANDS, WISCONSIN, 2018, and E PLURIBUS UNUM. 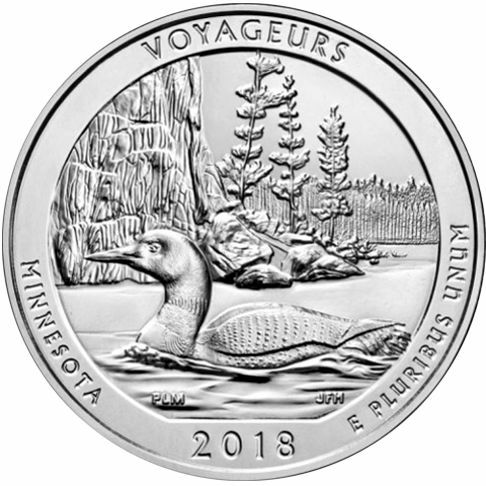 Inscriptions: VOYAGEURS, MINNESOTA, 2018, and E PLURIBUS UNUM. 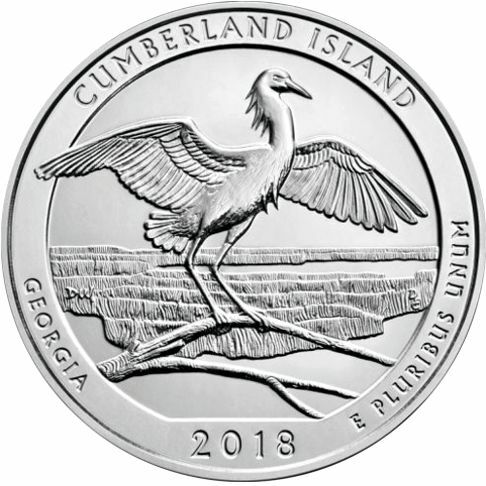 Inscriptions: CUMBERLAND ISLAND, GEORGIA, 2018, and E PLURIBUS UNUM. Reverse: shows a black-crowned night-heron flying over a beach, with a view from Cow Cove looking towards Sandy Point. 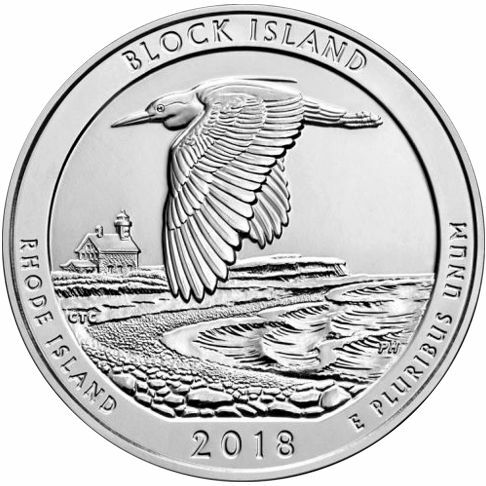 Inscriptions: BLOCK ISLAND, RHODE ISLAND, 2018, and E PLURIBUS UNUM. Reverse: displays a girl working in a mill, at a power loom with its prominent circular bobbin battery. 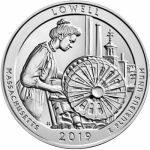 In the window is a view of Lowell, including the Boott Mill clock tower. 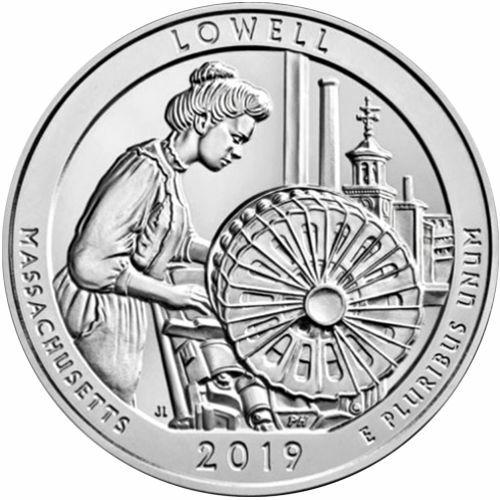 Inscriptions: LOWELL, MASSACHUSETTS, 2019, and E PLURIBUS UNUM. 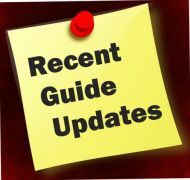 Reverse: shows a young Chamorro woman in traditional dress at the front of the Flag Circle and Court of Honor. She is resting her hand on the plaque whose text honors the sacrifice of those who died in the liberation of Saipan. 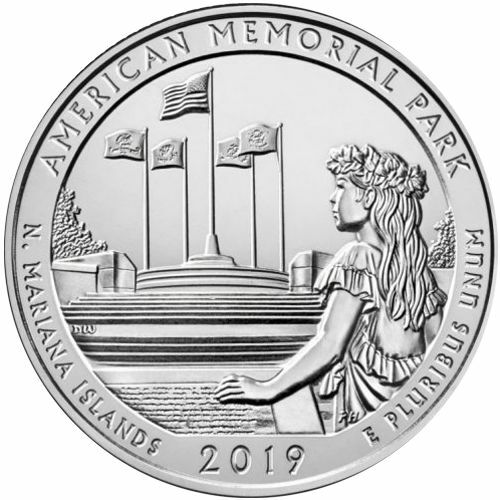 Inscriptions: AMERICAN MEMORIAL PARK, N. MARIANA ISLANDS, 2019, and E PLURIBUS UNUM. Reverse: depicts American forces coming ashore at Asan Bay, fortifying the number of troops on the island in the fight for Guam and its eventual liberation. 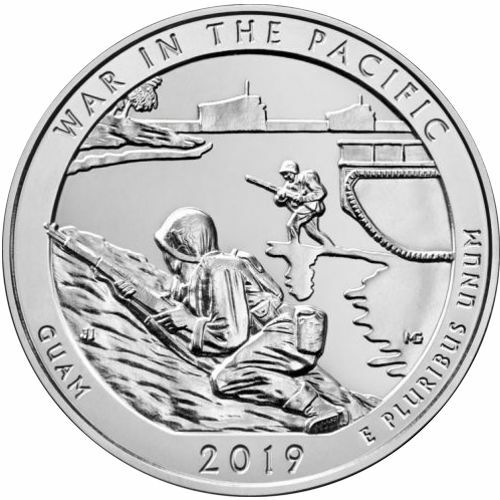 Inscriptions: WAR IN THE PACIFIC, GUAM, 2019, and E PLURIBUS UNUM. Reverse: depicts elements of the Spanish Colonial Real coin to pay tribute to the missions. Within the quadrants are symbols of the missions: wheat symbolizes farming, the arches and bell symbolize community, a lion represents Spanish cultural heritage, and a symbol of the San Antonio River represents irrigation methods and life-sustaining resources. 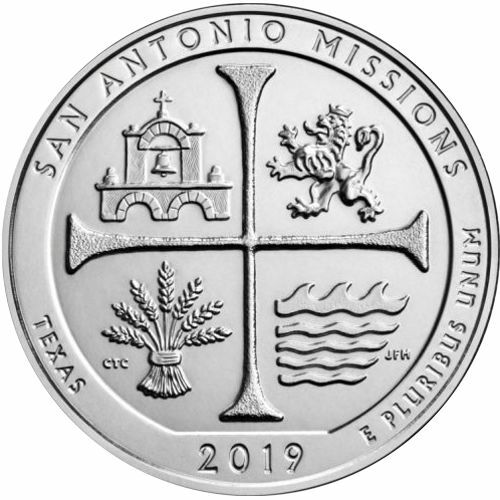 Inscriptions: SAN ANTONIO MISSIONS, TEXAS, 2019, and E PLURIBUS UNUM. 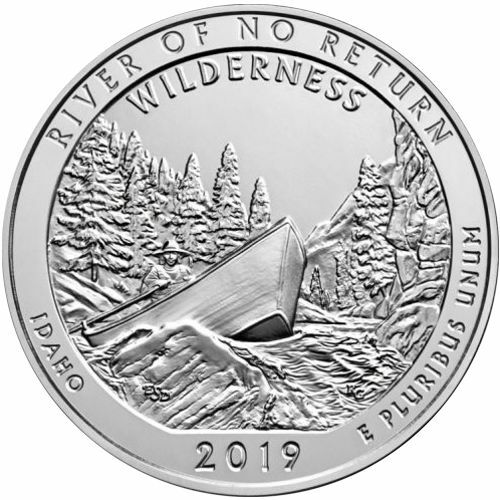 Inscriptions: RIVER OF NO RETURN, WILDERNESS, IDAHO, 2019, and E PLURIBUS UNUM.